It's been two months now since Travis's family moved from their shabby old house to a development so new that it seems totally unreal. There's one place, though, where Travis can connect with his old life: the Salinas library. He and his parents used to go there together every Saturday, but now he bikes to it alone, re-reading his favorite old books. It's only natural that Travis likes the work of John Steinbeck - after all, Salinas is Steinbeck's hometown. But that can't explain why Travis is suddenly seeing Steinbeck's characters spring to life. There's the homeless man in the alley behind the library, the boy who writes by night in an attic bedroom. Travis has met them all before - as a reader. But why are they here, and how? As Travis struggles to solve this mystery, budget cuts threaten his library. 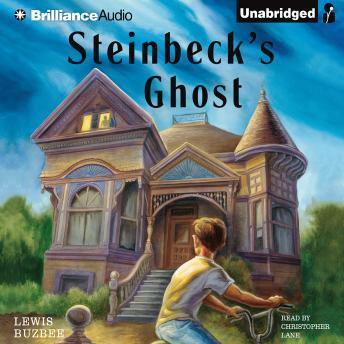 In looking for a way to save his safe haven, he begins to sort out fact from fiction and stumbles into a story Steinbeck might have started, and Travis needs to complete. Here is a mystery that delves deeply into the ways that books take us, one at a time, out into the vast world.